Whereas both turnip and rutabaga belong to the cabbage family, Brassicaceae (Cruciferae), they belong to different species. Turnip belongs to the species Brassica rapa L. (together with Chinese Cabbage and Bok Choy) and rutabaga belongs to the species Brassica napus var. napobrassica (L.) Rchb. 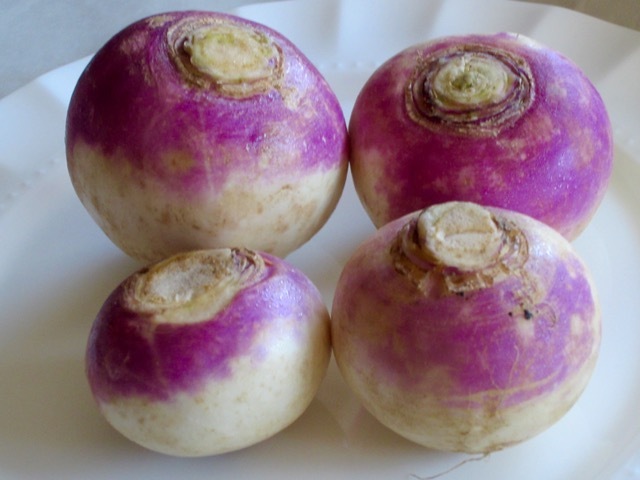 Turnip is usually just called turnip but rutabaga may also be called: Swedish Turnip, Swede, Neeps, or yellow turnip, and this can sometimes be confusing. In Canada the local stores market rutabaga as rutabaga so no confusion. 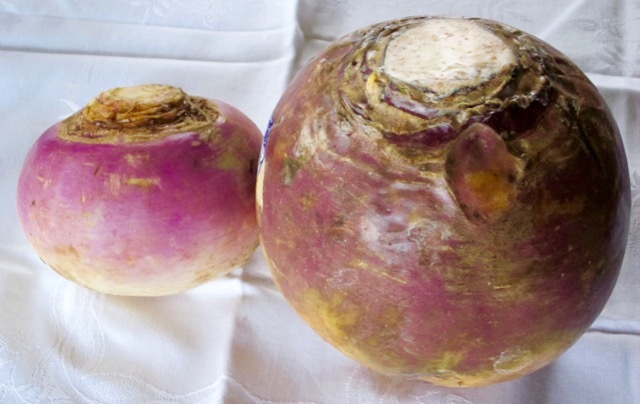 Point to note: in Scotland, North East England, Ireland, the Isle of Man and Cornwall the turnip is usually called “swede‘ so this can cause some confusion. In general store-bought turnips are usually smaller in size (less than 5-inch diameter). Rutabagas are usually bigger in size (5-6-inch) in diameter. Whats the difference between turnip and rutabaga? 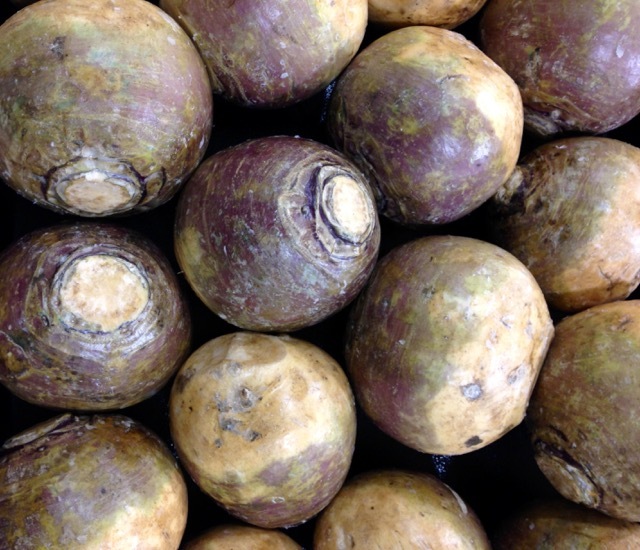 Rutabagas are large and round, often with a rather lumpy and irregular shape and a pale yellow to brownish (tan) to purple skin. Turnips are smaller, round and somewhat flattened. The most common commercial variety of turnip is white with a purple band at the top (crown), where it is exposed to light during growth. The band at the top may also be green or reddish pink in colour. Turnips on the other hand, lack the concentric rings found at the crown of the rutabaga. Completely yellow, red, or white turnips also exist (not common in-store). Most commercial turnips have a white flesh which is more moist compared to rutabaga. Yellow fleshed turnips are uncommon. The turnip skin is never waxed. If scrubbed well young fresh turnips can be cooked skin-on. The rutabaga skin is usually waxed to help retain moisture and give it a longer shelf life. Store-bought rutabagas must be peeled to remove this wax before cooking. Rutabagas have a stronger, somewhat peppery and sweeter flavour and turnips have are mild to slightly bitter in flavour. Turnips have no beta carotene. Rutabagas have beta carotene and more vitamin C than turnips. Both turnips and rutabagas can be boiled, baked or microwaved, but larger rutabagas are best just boiled until tender and mashed. They can both be added to soups, stews or casseroles. They can be mixed with potatoes and mashed. Personally, I prefer mashed rutabaga to mashed turnip. Due to the less moist flesh and the waxing, rutabagas somewhat store better and longer than turnips. Posted in What is the difference? Interesting – I haven’t eaten either one since I was a kid. Not sure why. My mother would cook the rutabagas with potatoes, and mash them up together. I never thought about them one way or the other. That was just what was served that night. Should give this a try. Thanks for the pointer. Hey Sorry I had an extra busy weekend. Yeah you should give rutabaga a chance. I cooked them with sweet potatoes the other day-mashed. So good. But the beets take a longer time to cook (40-50min) so you have to give them a head start before you add the potatoes which cook in a shorter time. Have a lovely week! I do fresh beets in the InstantPot – very quick, and so delicious. There are lots of beets in store right now. Red and golden yellow. Very pleasant. I should do some fresh beets too! Thanks for this helpful comparison of rutabagas and turnips. Wow, I’ve never heard of Rutabaga. How come? we have them here in plenty in my local store. They are huge and heavy. Have a great weekend! The weekend will be nice and warm. Thank you. Oh there you go Gary now I’m sure you know what they are. Thanks Beck! Ahh, that makes sense. Thanks Beck.